You are here: Home > Technical Analysis > How Do You Exit? There are two parts to any spreadbet, making it and closing it. And closing it can happen in two distinct ways, either as a loss, or as a gain. When you place a bet you at least have a mental note of where those two positions are, even if you do not put them in the market. I’ve already spoken of the easy and obvious ways that you close a bet, but the topic is worth a little more thought, as it is as important as making a bet in the first place. However you choose your entry point, you have a choice of how you trigger your exit. Your stop can be triggered by an indicator, a price, or by time, and each method has advocates. The most common idea is to exit at a certain price, but whether that is a fixed price or moves with the security is another option. The trailing stop is a frequently used method to try and maximize the gain while avoiding too much loss. It’s a price based method, with the stop self adjusting to follow the price when it advances, and never retreat, creating a ratchet effect. However you choose the amount that the trailing stop will be behind the price, which can be a set amount or a percentage, you will exit the bet as soon as the price drops back by that much (although it triggers a standard market sell order which may not be filled at the exact price). Some will object that a trailing stop can be triggered by daily fluctuations in the price. If it is, then the stop has been set too close. This doesn’t prevent a spike dropping you out of the bet before continuing, but the trailing stop is a fairly safe method of exiting a trade. Some traders like to use a version of the stop level that was made famous by the “Turtle Traders” trading group some years ago. This group had a rule that they would never lose more than 2% on any trade, which as mentioned before is a sensible level, so they set a stop loss to exit the trade if the losses came up to this figure. You can use a version of this when spread betting, applying the 2% to the underlying security price level, although with the leverage available when betting the equation is changed. You are more likely to use the 2% rule when betting to determine how much your initial stake will be to preserve your capital in the event of a loss. These stops come from the idea that your money should be doing something, and not sitting in a bet that doesn’t seem to be going anywhere. While your bet is open, you may be incurring interest charges and you certainly are at risk of a downturn. So any time that your bet is not performing to expectations, you want to limit how long you wait for it to start moving. Using this will depend on many factors, such as what time-frame you have in mind for your bet, and what has triggered your entry, but it is a good idea to at least re-visit any under-performing bets periodically and examine if the reason for making them has gone away. You may want to keep a calendar specifically for this purpose. These stops as a way of exiting a bet are perhaps more complicated, but may give you a better result. They are based on the price action, and therefore have the potential of being more relevant to the actual market, rather than being just an averaged answer. The downside to indicator stops is that they may end up costing you more than the notional 2% of the turtle traders. It’s a balance, as with all things. The 2% rule may take you out of bets that would have come round and kept on profiting, where an indicator stop would have kept you in the bet, and allowed you to make those later profits. The key is to try out different methods and see how they would work out on the markets you are betting on, then decide on one and use it for a time. 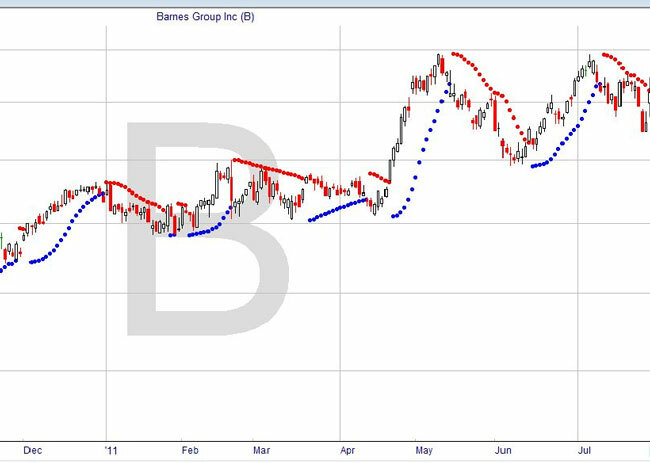 The moving average stop can be used whether or not you use moving averages in your trading plan. As the moving average is a direct reflection of the recent price levels, it moves day-by-day to set a new stop level. Many traders will use a 10 day or 20 day moving average on their chart, and choose to exit when the price cuts back through it. This gives a clear and decisive signal that is self modifying to the market conditions. The dots are plotted in blue in an up-trend, and switch to red in a down-trend, providing an even clearer indication of when to close your position. I particularly like this indicator because it is so straightforward and unambiguous. See how the dots are spaced out when the trend is going strongly, and bunch together as the trend slows down. The way to use it, using an up-trend as an example, is to keep in your bet while the dots are blue and below the chart. As soon as the trend falters and the dot switches to red above the price line, that is a signal to sell your open long bet, which can usually be done at about the level of the last blue dot.